This little girl is 21cm. 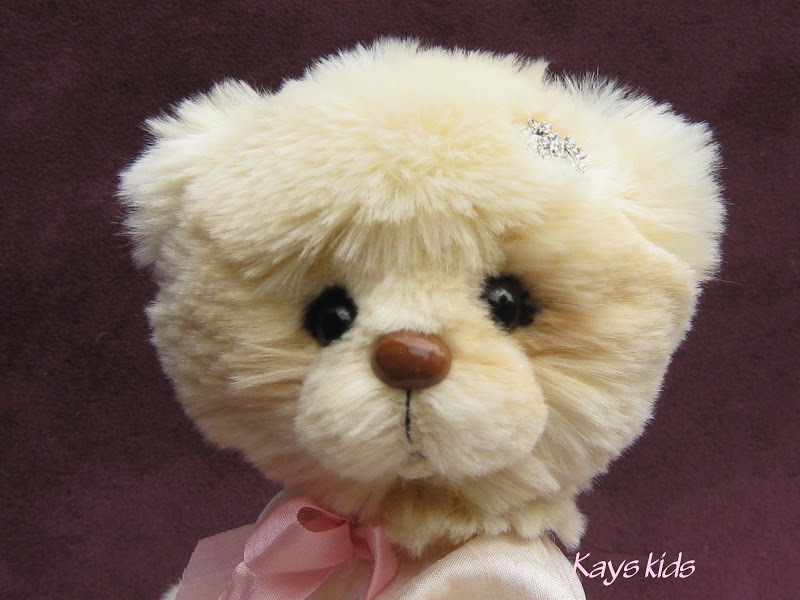 tall and is made out of Tissavel faux fur in a cream colour.It is extremely soft to touch. She has a sweet face that has been meticulously needle and scissor sculpted to make her cute little expression. She has a hand sculpted clay nose with thread mouth. Her eyes are black English glass, that sparkle. She has light shading on her face. Her paw pads are ultra suede and she is jointed with a cotter pin for the head and bolt and lock nuts for the arms and legs. She is filled with glass sand, a little pouch of stainless steel shot (to make her a nice weight to hold) and poly fill. She will stand on her own. She comes with a clay cream puff. Her favourite party food. 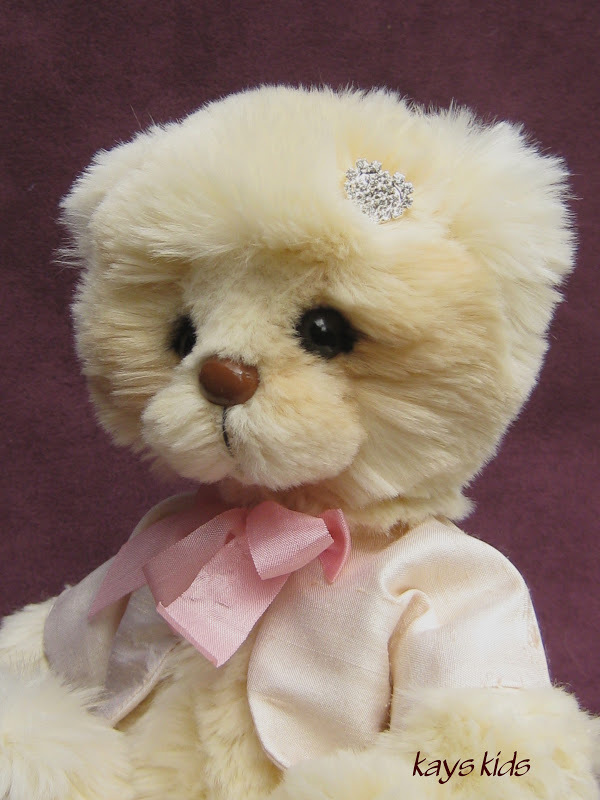 Cream puff wears a silk jacket in cream with a pink silk bow at the neck line. Plus a diamante heart in her hair. Cream Puff is available now. $90.00 Aust. dollars plus postage. I only post registered mail. I accept Pay Pal, Direct credit or Bank cheque. Cream Puff is a collectors bear and is NOT suitable for children because of small parts. If you are interested and would like more information please contact me by email. Cream Puff is waiting for a new Mum or Dad who will feed her cream puffs. Она прекрасна!!! !Мои мишки мальчишки..посылают ей воздушные поцелуи))))Красавица!!!!! It has become so sweet! I hope you will soon find a new home! Sorry about my English, but I have to translate with google translate. What a beauty. And you've chosen the perfect name for that little cutie! Aww, she looks gorgeously soft, and love that wee nose! Wow !!! Kay, she is absolutely adorable !!! love this fabric, this colour ...........love your work !!! bravo !! elle est merveilleuse !! You are very beautiful, and I should know because I was with you at the Onkaparinga Show last week. I can't help hoping that you'll stay with Granny for awhile, but I think you're so cute that someone is going to snap you up soon. Duffy, who stood next to you at the show and was too shy to speak,is smitten. He wants me to pass on his kind regards. Cream Puff is so cute!! She has the sweetest little face! Кейс, она действительно очаровательна!!! И это сердечко, как оно здесь к месту!!! 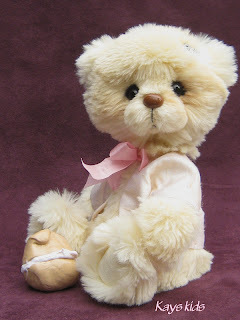 I say that Abby is my very last bear...but, I tell you that IF I could afford to do it...I would buy this little cutie pie in a heart beat! Your workmanship is ...nothing short of fantastic. Her sweet face reflects your personality...which makes her even more desirable to me. 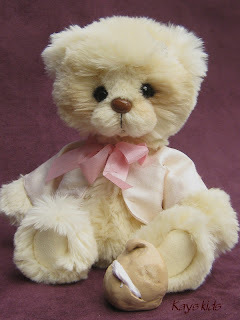 Hugs to Cream Puff and I hope she finds a Mum who will love her to pieces.. I fell in love with this work!